This morning I pedaled 25.1 miles my Schwinn 170. 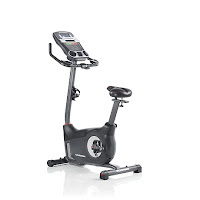 On Wednesday I pedaled 25.0 miles. The following are a quick summary of key numbers in my Trek. My overall goal is now to complete 50,000. To date I have completed 38,437.8 miles; 61,859.8 kilometers. I am now located at 84.41% of my current destination point goal. You will have to tune in to where I will jet to next when I complete my total journey on Mars. Jim’s Trek VI will include 11,798.4 miles. Here are the current stats of my Jim's Trek VI. *The date I began Jim's Trek VI; 11,798.4 more miles to reach 50,000. Does this mean that we as a people have stooped to a level that we allow a “false leader” debase the nature of what may be considered a critical phrase, as “national emergency” to the point that it is his idiosyncratic and egotistical definition which he is attempting to sway the tide of American know-how and authority? Last night's Supper attempt is Roast Fish with Cannellini Beans and Green Olives, and Roasted Cauliflower. And for dessert - Blueberry Glazed Yellow Cake. 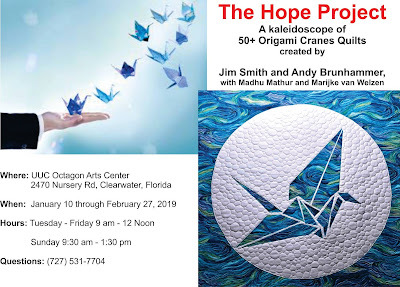 Our Hope Project will be on display through February 27 at the UUC Octagon Arts Center on Nursery Road, Clearwater, Florida. When you decided to attend, please give the Church office a call at (727) 531-7704 to make sure that the Octagon Arts Center will be open, and that the lights on the exhibit are tuned on. 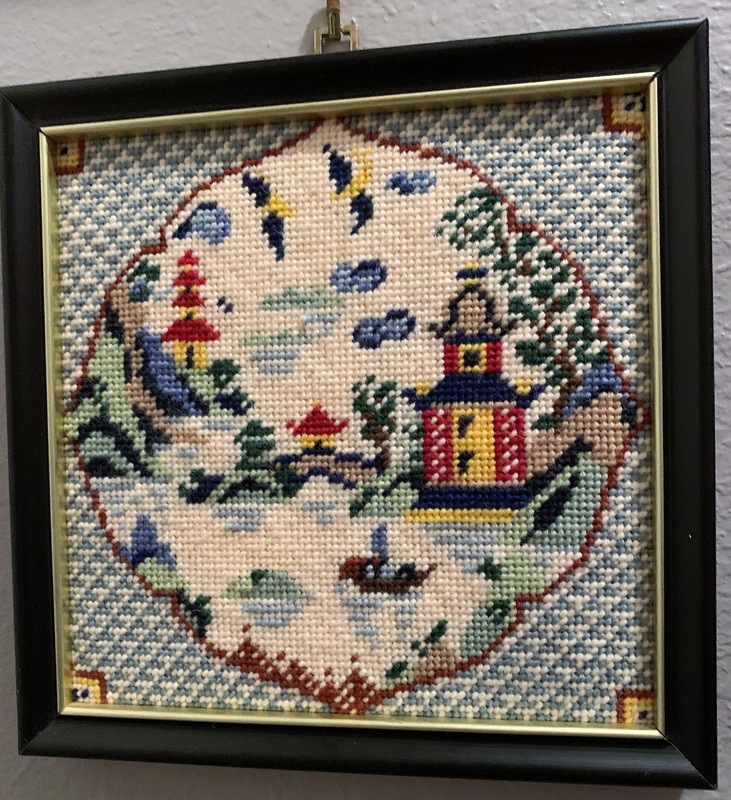 Our "Two-Men" display will exhibit at the Charles J. Fendig Public Library at 3909 W. Neptune Street in Tampa. “Two-Men” will continue and be available for viewing during Library hours through the end of March. The background to our new CYaY quilt has been completed. Now we are working on the foreground design. Definitely something new and different to add to our Portfolio. My 4-times Great-Grandfather Philip Abrahams, was also Feivel Goldsticker, (Goldsticker being Hebrew for Embroiderer). 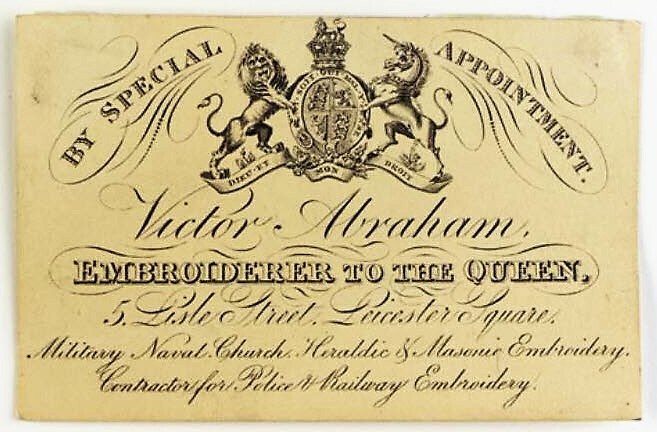 His son, Victor Abraham, my 3-times Great-Grandfather was appointed Embroiderer to Queen Victoria. 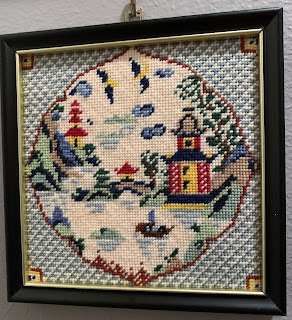 I did these 2 pieces of needlepoint quite a number of years ago. 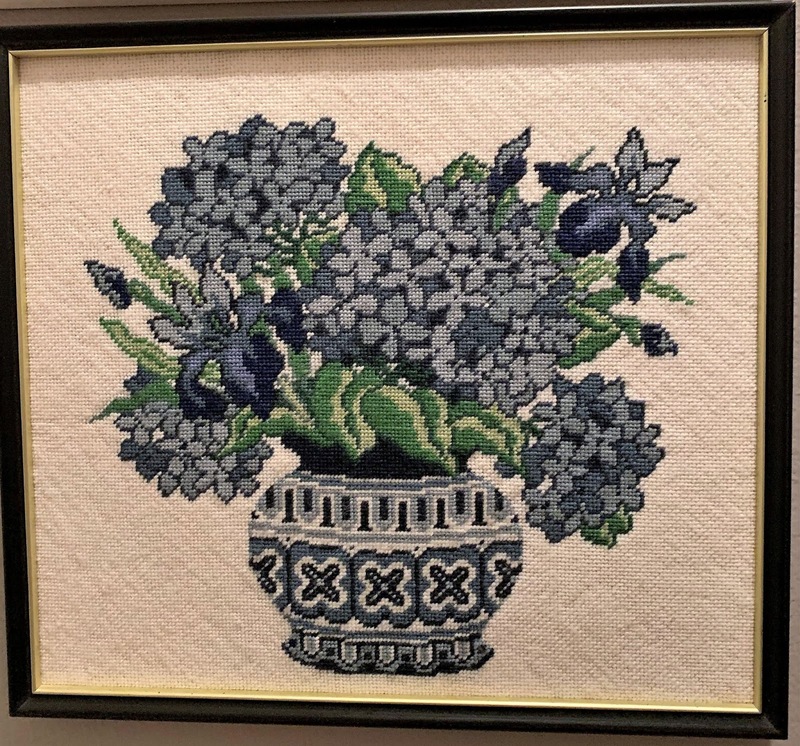 Andy's 2-times Great-Grandfather Jacob (aka Jacques) Brunhammer was a Textile Designer in Alsace, France. And Andy has a degree in Textile Engineering. Looks like there may be something passed along by ways and means of familial connections. This is my 1,781st post. Per Blogger Jim’s Trek has recorded, as of this writing, 217,952 Pageviews. June 17, 2015 - About Health - Can You Reverse Diabetes? ©Jim’s Trek 2012-2015. Simple theme. Theme images by jacomstephens. Powered by Blogger.